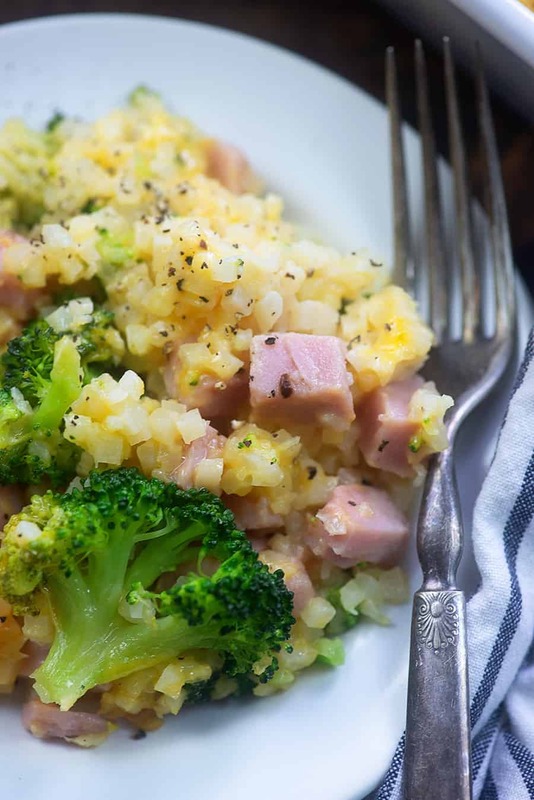 Ham casserole starts with leftover ham, cauliflower rice, and broccoli. Total comfort food, but it’s packed with veggies, low carb, and makes a healthy dinner the whole family loves. Am I the only one that could literally eat casseroles every day and never get tired of them? I get so tired of a chunk of meat and a couple of side dishes for dinner. It seems so much easier to get creative and make new things when you turn them into a casserole! 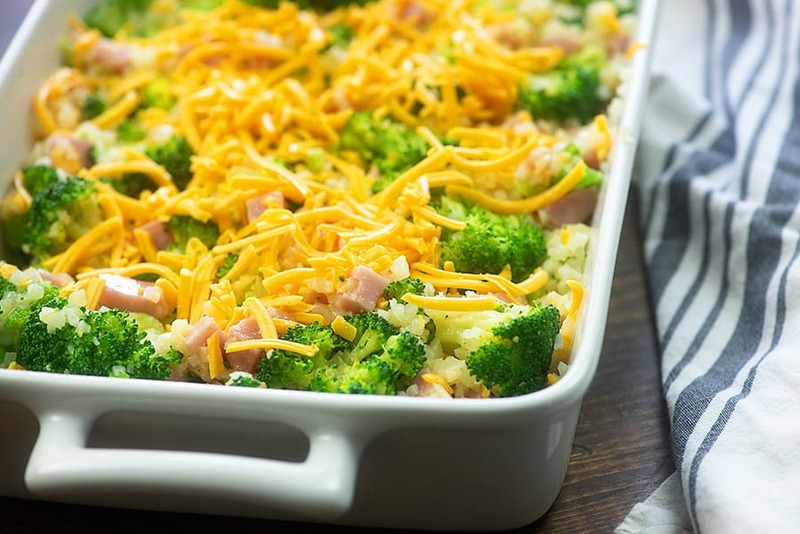 This ham and cheese casserole totally satisfied my casserole craving and it’s low carb! Total win! This recipe is great with leftover ham, which I seem to have on hand often. 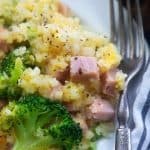 Ham is a great low carb dinner and we make it often – it’s not just a holiday thing in my house! If you don’t have leftover ham you can purchase the little bag of diced ham to use for this. Either will work fine! The base of this casserole starts with cauliflower rice. I like to purchase the bags of frozen cauliflower rice for this because it makes this a super quick and easy weeknight dinner, but you can totally toss some cauliflower florets in your food processor and make your own cauliflower rice. 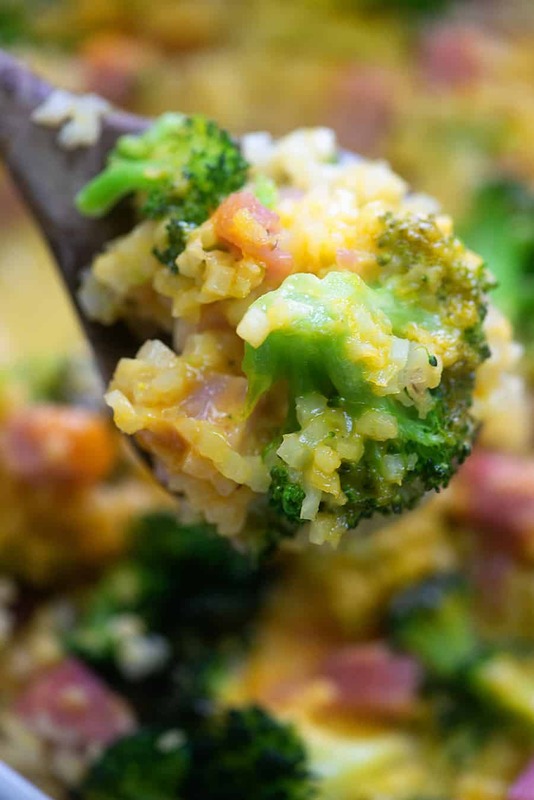 Steam or microwave your cauliflower rice and some broccoli florets. Pre-cooking the veggies before they go into the casserole means that things won’t get overly watery and will cook perfectly in the oven. 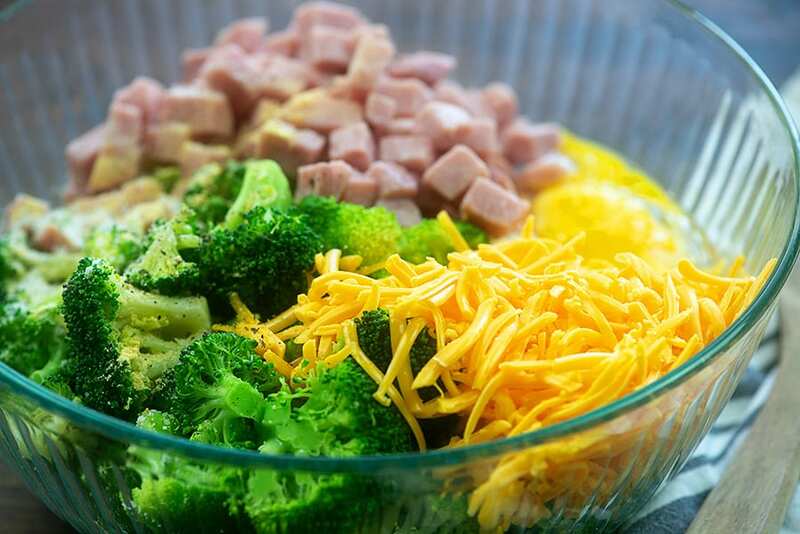 Add your cooked cauliflower rice and broccoli to a large mixing bowl along with some ham, shredded cheddar, eggs, some mustard powder, garlic powder, salt, and pepper. Mix it all up and pour it into a 9×13 baking dish. Sprinkle on some extra cheese for good measure. This bakes up in a 350 degree oven in just 30 minutes. 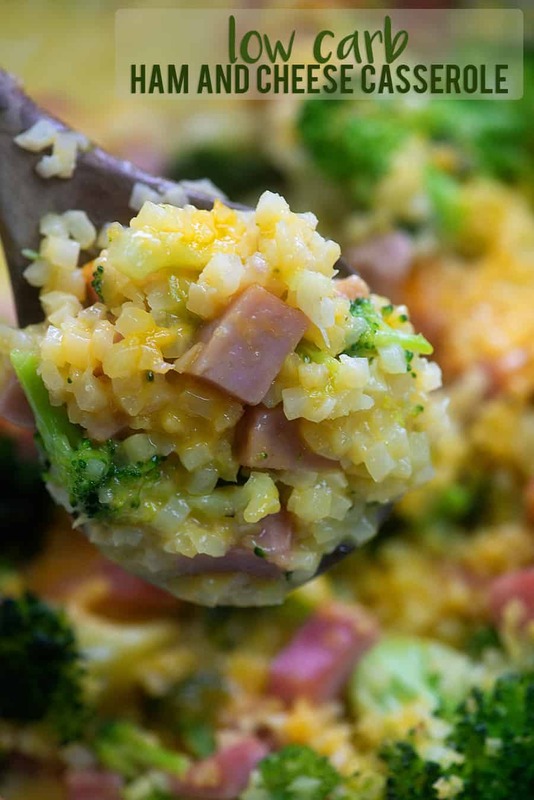 What comes out is a delicious, cheesy ham casserole that’s packed with veggies and flavor. Fried Cabbage with Smoked Sausage: This dinner comes together in no time and it’s always a hit. Stuffed Zucchini: If you’re craving pizza, you’ve got to try these zucchini boats! Low Carb Pulled Pork: I cook this one in the slow cooker and top it off with my mustard BBQ sauce. I mad this tonight and I used a coarse grained mustard and it added some great flavor! Also I used Swiss cheese just on the top…it was awesome!! I usually just cook for me and my husband, so I baked this in two 7×11 dishes. Swapped dry mustard for a tablespoon of stone ground and used Swiss cheese and crushed pork rinds for the topping. Delish and filling! This was mostly delish but I think I’ll leave out the mustard powder next time. I used only 1 tsp and it was still pretty overpowering. what can you use instead of cauliflower. my wife does not like it or zucchini, or squash. I don’t have any other suggestions for this one, I’m afraid. Very deliciouse and perfect portions of ingredience!! !